Door of Bialystoker Center and Home for the Aged. Credit: CityLand. Retirement home served the Lower East Side’s Jewish community from 1931 until it closed in 2011. 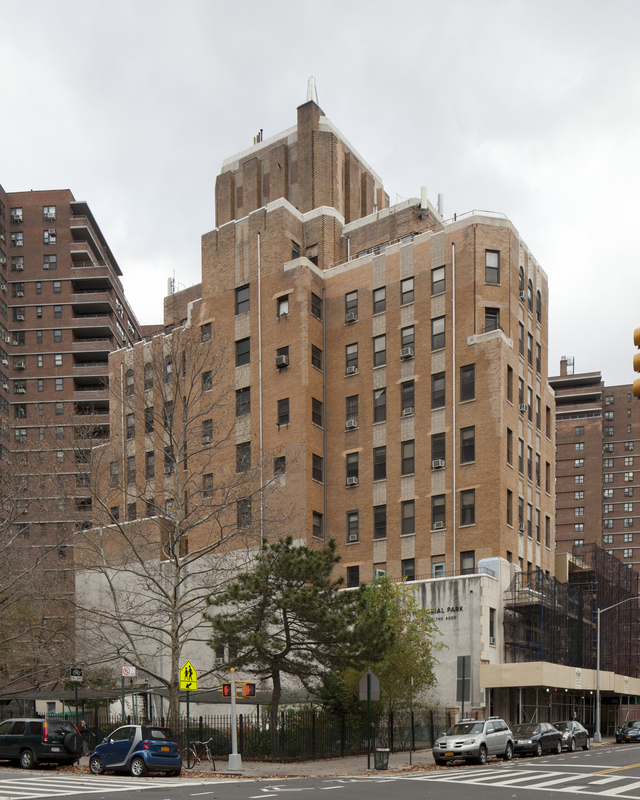 On February 12, 2013, the Landmarks Preservation Commission held a hearing on the potential designation of the Bialystoker Center and Home for the Aged at 228 East Broadway in Manhattan, as an individual City landmark. Built between 1929 and 1931 to designs by architect Harry Hurwit, the Art Deco Bialystoker Center was built by a Jewish benevolent society, established in 1921. 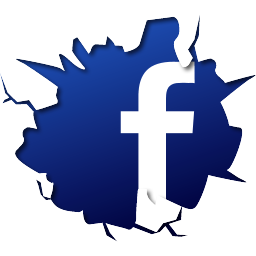 The Center initially focused on relief efforts in Europe and the assistance of recent immigrants to New York. In constructing the building, an essential component was the incorporation of a home for the aged to support the existing Jewish immigrant community in the City. The ten-story building is clad primarily in brick, with terra-cotta ornament and a limestone base. The building features an ornate entrance and bas relief rondels bearing symbols of the Twelve Tribes of Israel. The Landmarks staff noted that the building was one of the few buildings in the area to emerge unscathed from the Seward Park urban renewal projects of the 1960s. Gary Ambrose, representing the Board of Trustees for the home, did not oppose designation and stated “we cherish this building and its history.” He expressed pride in the Center’s role in the social development of the Lower East Side. He said, however, that the Board’s primary responsibility was to raise the necessary capital to honor the Center’s financial obligations. The Board’s goal had always been “to keep the Bialystoker Center operational.” The Board had hoped to sell the property to an operator who would commit to modernizing the nursing home to no avail. The home was forced to close down in 2011, due to the building’s obsolescence for modern care and declining health care reimbursements. Ambrose said the nursing home’s closing left many families without nearby alternatives and many long-time staffers without employment. The Board now has significant debts to former employees, vendors, and the government, which it had hoped would be resolved through the sale. Many former employees, who are union members, still continue to wait for repayment of back wages, benefits, and pension funds. Ambrose stated that the Board is in discussion with several prospective buyers who understand and accept the pending landmark designation, but no contract of sale has been signed yet. Ambrose said he hoped to work with Landmarks towards a “win-win” situation where the building would be preserved and could be sold for a sufficient amount of money for the organization to meet its obligations. Council Member Margaret Chin attended the hearing to express her strong support for designation and testified to her belief that “the future of this building is still bright.” The structure could be profitably reused in a neighborhood “that is going to be a hot area.” A representative of Manhattan Borough President Scott M. Stringer also spoke in favor of designation, stating “the Bialystoker Home serves as a reminder of the many immigrant groups that have moved to this country with the intention to grow roots and age within a community.” Landmarks Chair Robert B. Tierney stated that State Senator Daniel L. Squadron had sent a letter to the Commission supporting the designation. Bialystoker Center and Home for the Aged at 228 East Broadway, Manhattan. Credit: CityLand. Various area residents and representatives of local community organizations also attended in support of designation. Carolyn Ratcliffe, of Manhattan Community Board 3’s Landmarks Subcommittee, read a resolution in favor of designation. She argued that the building was part of a triumvirate of socially and architecturally significant sites related to the area’s Jewish history, along with individual landmarks such as the Forward Building and the Jarmulowsky Bank. Kerri Culhane, Associate Director of the Two Bridges Neighborhood Council, described the building as among the “important architectural and cultural touchstones” of the Lower East Side. 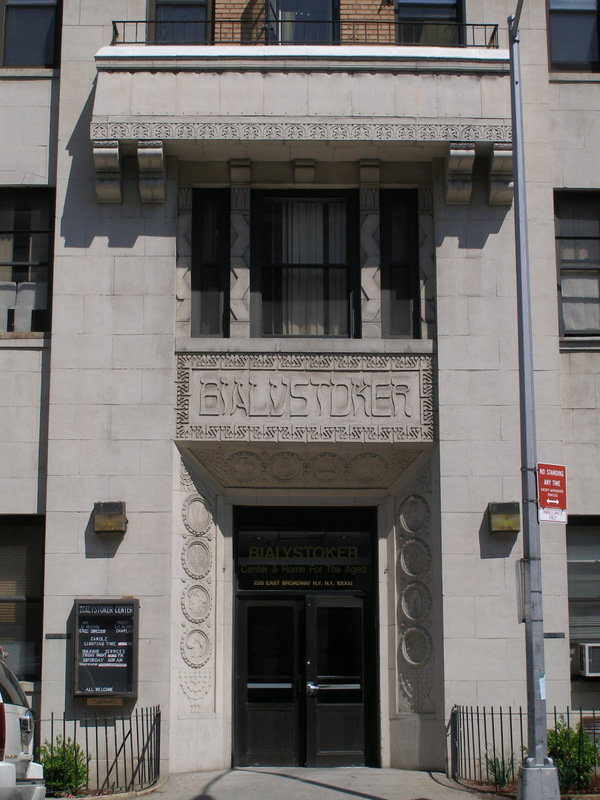 Friends of the Lower East Side’s Linda Jones claimed that the building “can survive to find a new use.” Resident Justin Ferate noted that the Bialystoker Center was among the first major Art Deco structures built in the United States and said that “much of the Lower East Side’s historical memory continues to be endangered” by development. Rob Hollander, of the Lower East Side History Project, drew attention to the building’s unique setbacks, which he called an “imaginative solution” to the new zoning laws during the Art Deco movement. Developer Michael Sokolow testified that the building had the potential for adaptive reuse and also possessed transferable air rights. Chair Tierney closed the hearing, with no date set for a vote on the building’s designation. LPC: Bialystoker Center and Home for the Aged, 228 East Broadway, Manhattan (LP-2529) (Feb, 12, 2013).